The mission of the UANYC's Career Development initiatives is to foster professional relationships of Alabama alumni in the Greater New York area and to further connect UANYC members with students, faculty and administrators at the University of Alabama. To suggest a career development event or initiative or submit a listing for our job board, contact the chapter at alumni@uanyc.com. UANYC, in partnership with the Manderson Graduate School of Business, hosts a Student Career Development Panel in Tuscaloosa the Friday before a home football game. A group of UANYC members make the pilgrimage down to Tuscaloosa each year to meet with current Alabama students who are possibly interested in moving to the Greater New York area upon graduation. The panel helps UANYC build awareness about the chapter and recruit the best and brightest graduates to the Big Apple. 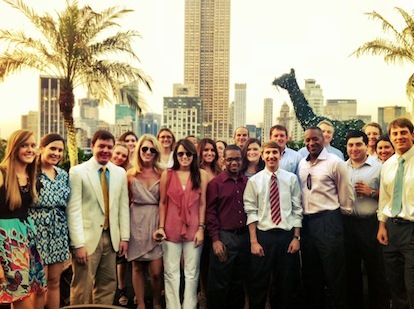 UANYC hosts networking receptions and events as opportunities to engage chapter members with students, facility and/or administrators from the University who may be visiting the Greater New York area and connect other Alabama alumni across the country.